This year Nike came out really strong with their Hyperdunk 2017 family featuring the newest REACT cushion setup. It definitely wasn‘t a BOOST killer how many of you were expected to be including me as well. But it has its own advantages that still make this setup enjoyable and for somebody even better than BOOST. 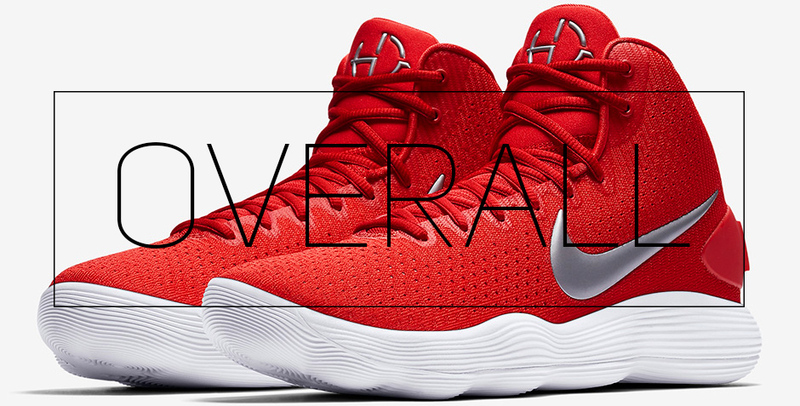 So after a BEASTLY Flyknit version of the Hyperdunk 2017, it‘s time to put our hand on less expensive, more budget friendly version. Let‘s see if they can keep up with the Flyknit version. So, of course, the biggest difference on the regular version is the upper. 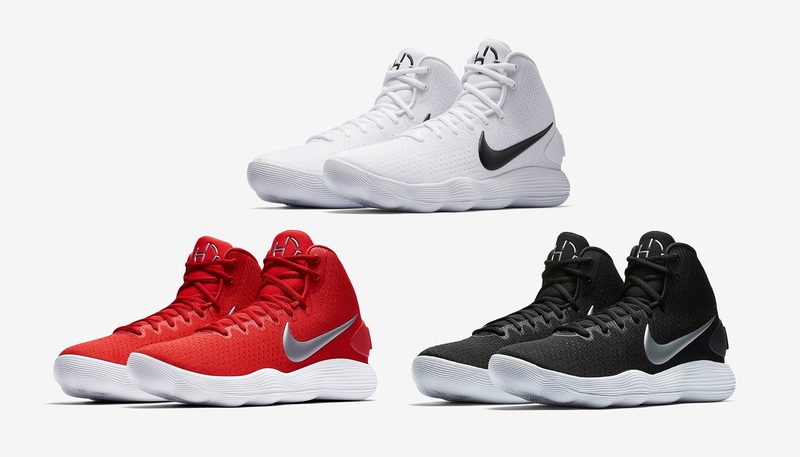 As the majority of Nike budget friendly models, the Hyperdunk 2017 features textile Mesh & fuse overlays around the eyelets for additional durability. The textile Mesh upper is way different from what we used to see in the past. From looking at it up close, you can clearly see knitted upper like pattern, so it does look like “budget Flyknit”. Now on foot experience was different as well. This mesh upper does not have any other overlays apart mesh itself, so no fuse backing on the toe box, no-sew overlays, nothing. That’s why they feel super light on your foot & offer really solid breathability. 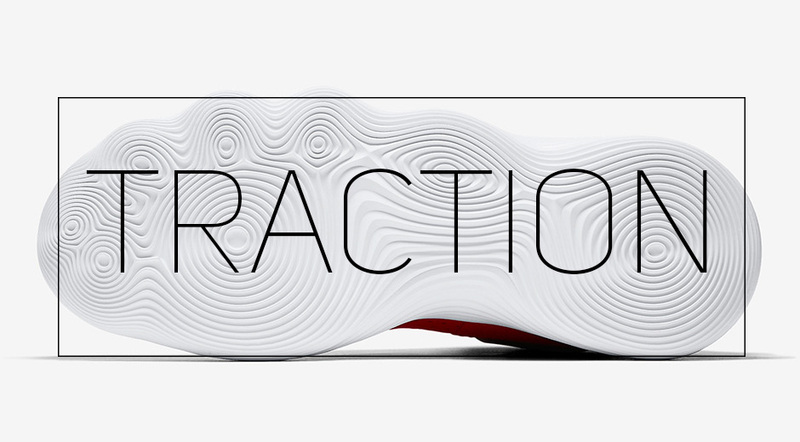 The midsole & outsole is completely identical to the Flyknit or Low top version and that means the same REACT setup as well. REACT offers something to enjoy for every type of player. Guards will be able to move freely without any lag or delay to their moves due to one of the best response is the market right now. Also, the midsole sits quite low to the ground, so court feel is something that guards will appreciate either. For Stronger, bigger & more physical players that good amount of impact protection will be the main factor to enjoy this setup as much as I did. 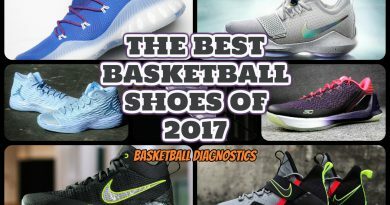 This year we received quite a few performers with killer traction and the Hyperdunk 2017 sits right on top of this list with the Crazy Explosive 2017 on the side. Both main team models from Nike and adidas has really phenomenal traction and for me, it’s hard time choosing which one is better. On clean courts the outsole acts like glue, I’m not joking. Mad traction. Now, on dirty or semi-dirty courts minimal whipping is required, but after that the traction switches on a beast mode again. However, the rubber compound isn’t so durable, that’s why I don’t recommend using them outdoors. Unless, you’re playing on those tennis like courts. While the textile mesh does look like knitted upper, it doesn’t have the same properties that true Flyknit has. This upper doesn’t stretch completely, that’s why compering to the Flyknit version, the fit is looser & less adaptive to your foot. But keep in mind, this is a 20$ cheaper version. There aren’t any Flywire cables, that’s why I missed that snug, one-to-one fit like on the Flyknits and for this price, in my opinion, Flywire system is a must. However, mesh is pretty soft to your foot and by any means doesn’t feel cheap or uncomfortable like other budget models do, so I can’t be completely disappointed because despite lack of stretchiness & snugger fit, this upper is quite darn awesome. As far as the actual fit goes, just go whatever your true size is and you will be golden. Talking about support features, the regular version does compromise one main support feature and that’s Flywire cables. It would be a disaster if we wouldn’t have received it on the Flyknit version, but on the regular version it’s not a big deal. Other than that, the support tech list isn’t very impressive by any means but it gets the job done and that’s the most importing thing. We have an external molded heel counter with Nike branding and that’s pretty much it. Of course, mesh itself does pretty solid job keeping your midfoot from rolling over the foot bed, so as I said, Flywires isn’t a factor here. The heel counter is now external for this model but it does not change anything at all – same solid heel containment all game long. They won’t be the most supportive shoes out there, but if support isn’t your main concern when choosing a pair, then these should be that sweet spot for you. And then so, if you still decide to increase foot containment, you can always put on an ankle brace. While the Nike React Hyperdunk 2017 is a better option for those who are looking for cheaper alternative, in my opinion they’re still overpriced. Looking at today’s sneaker market, you can easily grab $20-30 cheaper sneakers with premium upper & TOP 3 cushioning and I’m not talking about sales. On the other hand, they didn’t let me down as far as performance & esthetics go. 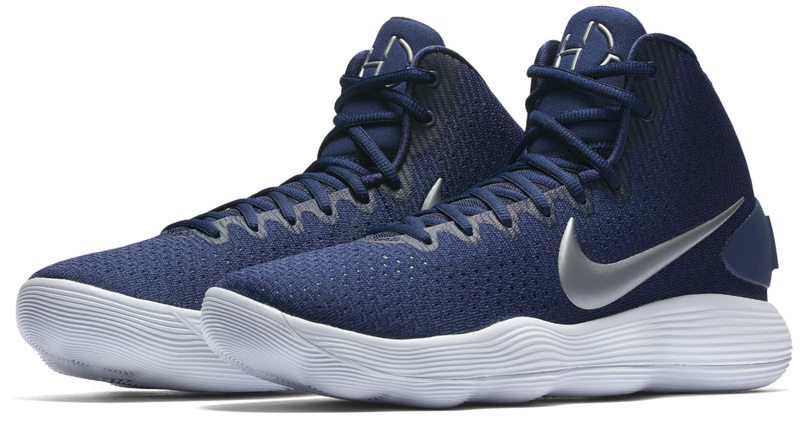 The lower part of the shoe is identical to Flyknit version and that’s perfect since the REACT cushioning offers all-around performance for any type of player and that killer traction is what every player will appreciate. Of course, it goes without saying that the Mesh upper can’t compete with Flyknit in terms of comfort and ability to create sock like fit. But it still gives you enjoyable experience though, especially after a very short break-in period. 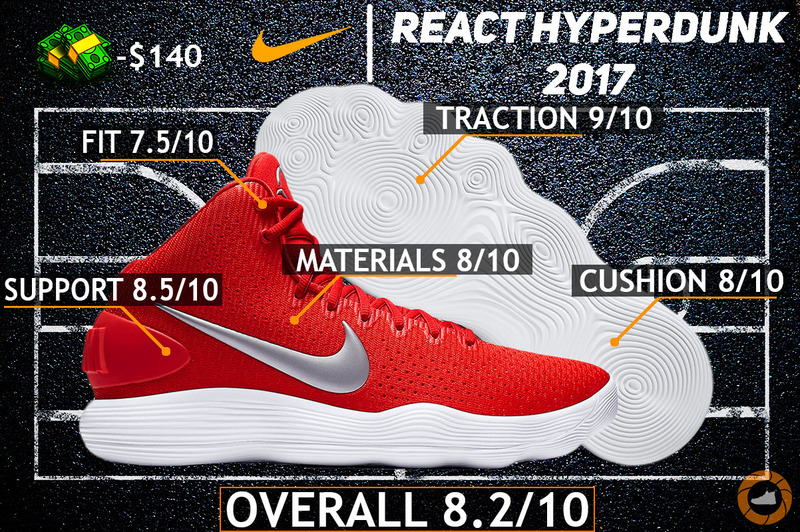 Hope you enjoyed my Performance Review on the NIKE REACT HYPERDUNK 2017. Will you be picking them up? Let me know! ← adidas Crazy Explosive 2017 Primeknit Low REVIEW – Why It’s Not Worth It? What shoes do you mean that are cheaper? The adidas crazy explosive 16′ low is $20 cheaper and, personally, they have more to offer, especially in the cushion department. Also, the Jordan Ultra.Fly 2 ($125) has crazy value for the money and again, it beats the regular version of Hyperdunks 17′ in some areas. I’m now testing these out, so expect performance review on the following week. Any chance we will get a top 5 of the year from you. Was also wondering if your gonna review the upcoming Brandblack future legend lows. I have the rare metals and if the traction was better they would be damn near perfect. That and a firmer outrigger. Maybe a top 5 all time while your at it. I’m planning my final TOP 10 list at the end of this year, so stay tuned for that. Oh yeah, definitely. 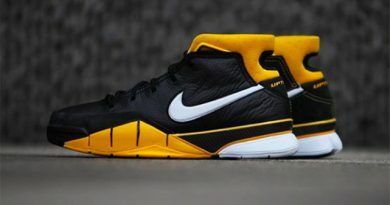 These are one of my favorite hoop shoes till now, always in my rotation. It would be a shame not to do a performance review on them. I agree with you on that. They would’ve been beastly performers with a bit better traction. Let’s hope they fix this in the Rare Metals 2 if it will be one. You gave me a pretty nice idea. Expect TOP 5 of all time this upcoming week. Nice. Looking forward to it. I remember loving the old jet flights. 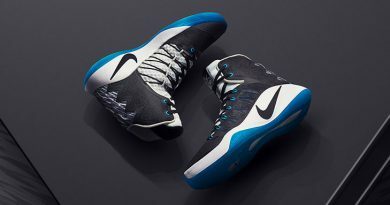 The ones Steve Nash wore forever ago. Performance aside I just loved that shoe. You’ve convinced me to go with the crazy explosives. Now I’m just waiting for some new color ways. Oh man.. I’m too young to remember them. Awesome! Which version? Keep me updated. Nike air jet flights. 2001 release and no sequel. Just saw the new Jordan 32’s. I think instead of the crazy explosives I’m gonna wait for a review on the 32 low first. They look nice. Not to big on the mid though. Great decision. They look hella promising with that beastly looking flyknit & synthetic leather combo. They just need to get the traction right this time. I think it’s worth to wait a little bit to see if they will deliver something awesome. If not, then you can easily cop a pair of the Crazy Explosive’s at any time.